Premium Bavarian Wheat brewed under the law dating from 1516. UPDATED: JAN 3, 2019 Rich golden color, not much transparency. Pours a light head, taste is sweet as others noted banana hints is left behind. Deze fles eigenlijk om het etiket aangeschaft, na het openen was de fles snel leeg. goeie Weizen die alle herkenbare punten in zich heeft. UPDATED: JUL 31, 2017 Botella 50 cl del c Inglés Oviedo tomada en Oviedo junio 2001. Fcpref 22..03..2002 EJ. (r192). Cereales frescos con algo de gas. Refrescante y fácil de beber. Normal. From old tasting notes. Cloudy yellow gold color. Huge rocky white head. Fresh yeasty citrus nose. Crisp, biting hop flavor has hints of lime and basil. 0,5l bottle. Hazy golden/yellow colour with slowly shrinking creamy white head. Aroma: Fruity citrus aromas with banana. Taste: Sweet rich wheat start with a pleasent tarty/slightly bitter mouthfeel. Has a quite creamy texture. Light/medium body with soft carbonation. Medium lasting tarty finish. Bottle 50cl / Botella 50cl. @ Cerveceria Internacional, Sevilla, España. A: Hazy golden / Dorado turbio. T/S: Wheat, yeast, banana / Trigo, levadura, banana. 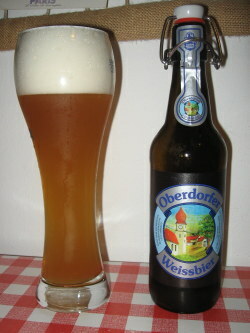 Bottled - Hazy yellow colour, large, stable white head. Decent banana aroma with cloves and crushed wheat. Taste is bread, banana, yeast and some disturbing citric sourness, that ruins the magic of a wheat beer. Light body, average carbonation, a bit watery mouthfeel, sourish finish. Not so bad, but without that sourness would be great. UPDATED: MAR 23, 2015 Botella. Amarillo pajizo espuma blanca buena formación baja persistencia. Aroma a levadura, plátano y algo a trigo algo especiada. En boca textura aquosa cremosa carbonatacion media viva. Dulce aquosa y toques de levadura. Le falta sabor y cuerpo para mi gusto. Demasiado ligera.